I can fit my 17″ laptop, it’s related gear like chords, mouse, cables and more, my lunch, a water bottle, a thick notebook and a book with no problem. Because of dedicated laptop sleeve, keeping your gear organized is a breeze. 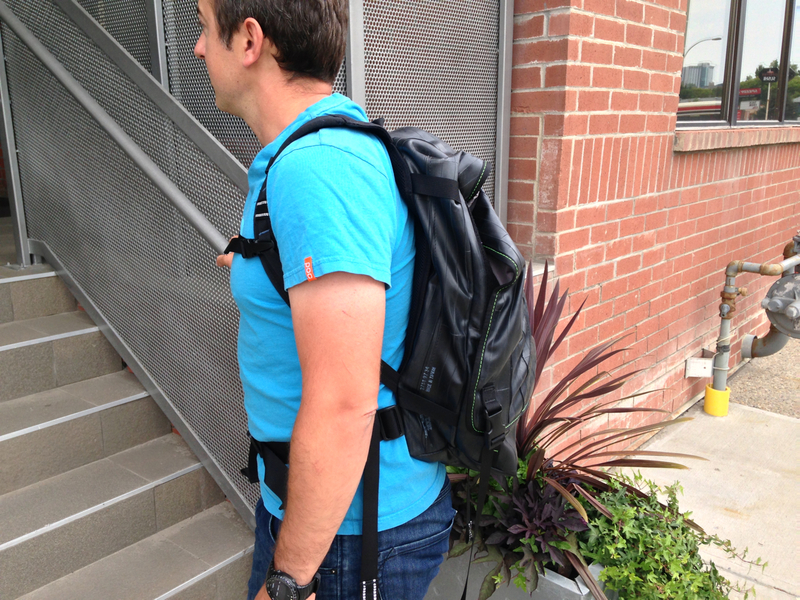 The bag is made of nearly indestructible, water repelling, ballistic nylon. It clams to hold up to 15 inch laptop, but I can get my 17 inch laptop in there easily. 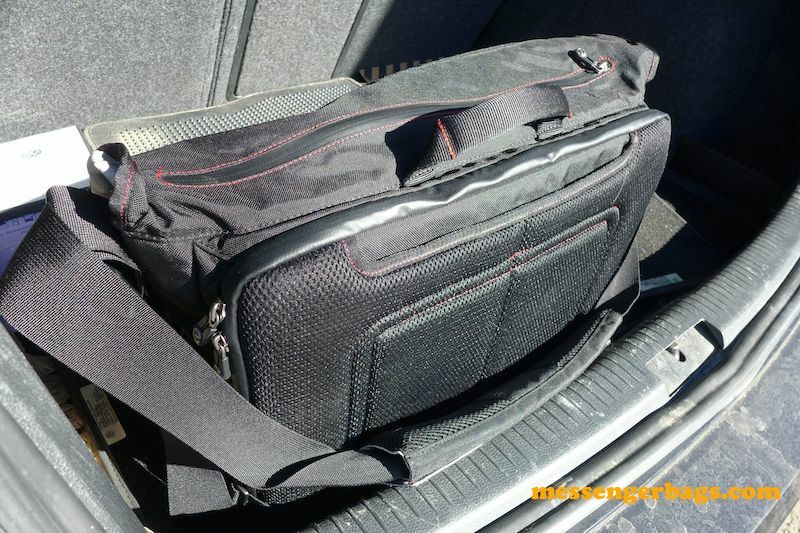 It comes with a modular padded insert, so smaller laptops and tablets stay safe and secure and don’t slide around. The modular insert can be used with a 15 inch laptop but not with the larger laptop. The bag features lots of room, everything you’ll need for a day at work. The bag is worn in a traditional ‘messenger bag’ style, over one shoulder. 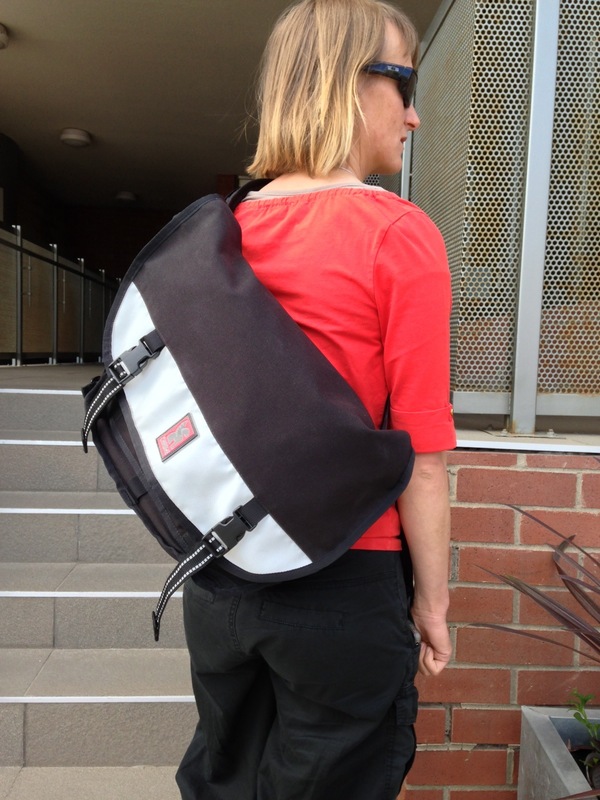 If you’re wondering how to properly wear a messenger bag, read our article here. 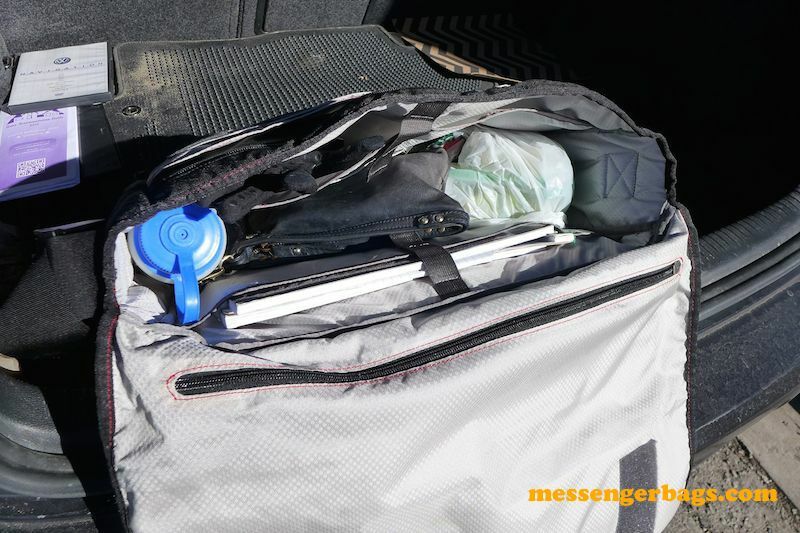 You can easily access the items in your bag without opening the top flap. The compartments are laid out in an easy and logical manner. There is also a top access zipper that allows you to access the contents of your bag without having to open the top flap. This is great when you need to grab your wallet, water bottle or something else without having to find a place to put the bag down so you can open it. It’s a nice feature and I haven’t seen it on any other bag yet. 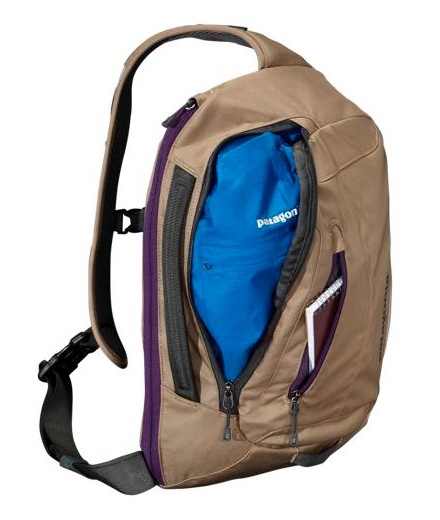 The bag has a very well padded back and shoulder strap, making carrying heavy loads comfortable. 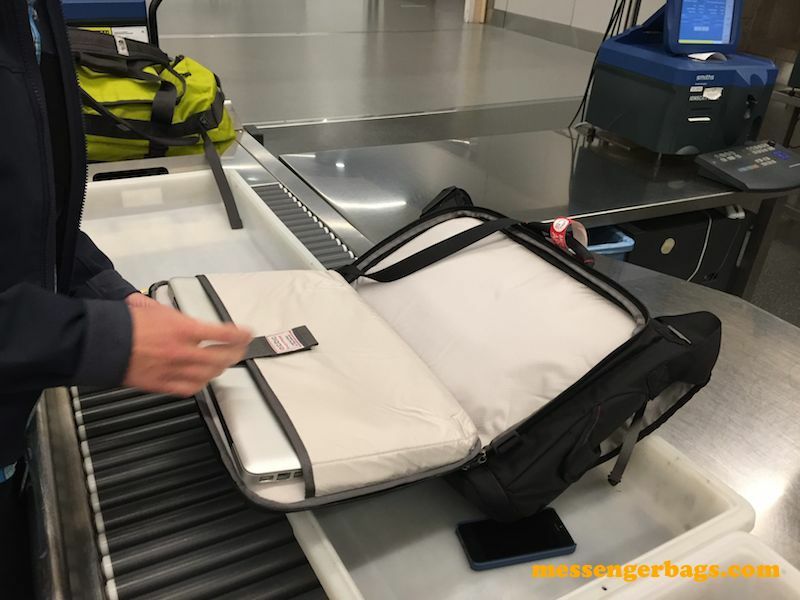 The main draw of this bag is ECBC’s dedicated “FastPass” system which allows you to go through security without actually having to remove the laptop from your bag. Using the FastPass system at security. The laptop sleeve is very convenient. 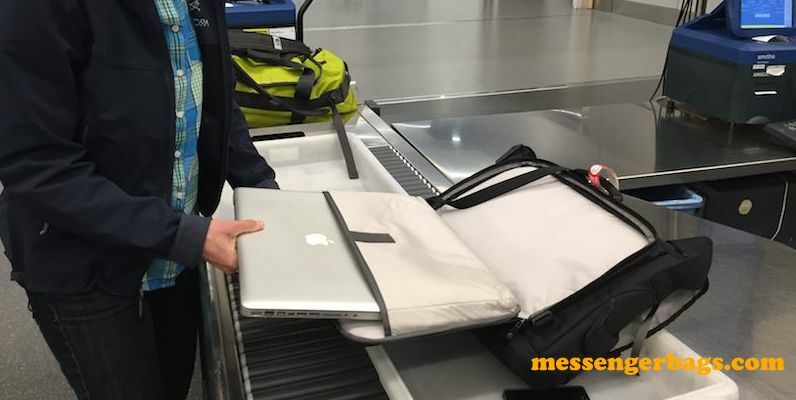 To benefit from this system, simply unzip the dedicated laptop compartment which is on your back, lay the bag flat on the security conveyor, and go through TSA security without unpacking your laptops, tablets and cables. Once you are through the scanner, simply zip up your compartment, and you’re on your way. You know that you’re electronics are safe and secure, and where you left them. No more standing around at the end of the line trying to fit everything back in your bag. I think it’s pretty safe to say that most travellers have been there. How many of you have left things behind in security? It happens to all of us. FastPass system ECBC’s special FastPass design is TSA friendly, and will allow you to keep track of your electronics in a stress free way while going through security. Dedicated Laptop Sleeve This dedicated sleeve is a real advantage of this bag. We love using it, it keeps things organized and everything else out of the way of your laptop. Great Capacity This bag is a decent size, and given the sleeve, you can fit a lot of extra things inside while keeping everything organized. 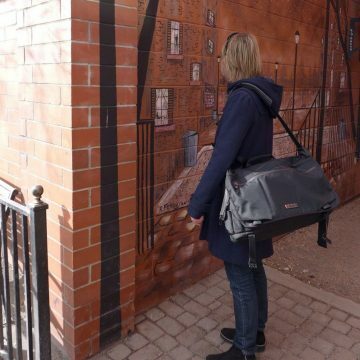 Great Padding and Support This bag offers excellent padding, which makes it super comfortable to carry, which is important because the bag itself is quite heavy. Top access zipper This allows you to access your gear from the top of your bag without having put your bag down and mess around with opening the top flap. Robust The bag is made of water repellant and very robust ballistic nylon, can take a beating, and can tolerate a small amount of inclement weather should you get stuck outside in the rain. 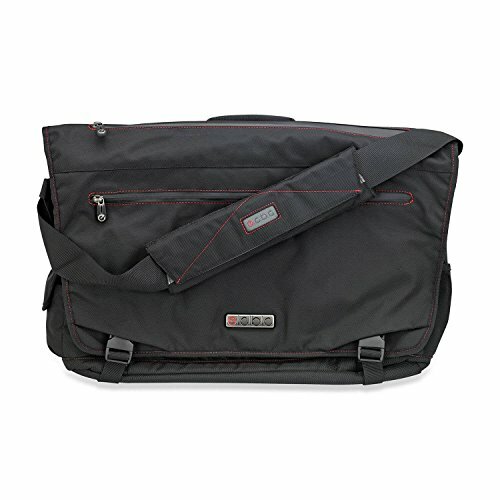 Heavy and Bulky Because of the generous padding that makes the bag super comfortable to wear, the bag is bulkier and heavier than most messenger bags. Size This bag is very wide and large in size, and sometimes I think of it more as a briefcase rather than a messenger bag. But with that comes the advantage of all that comfortable padding, making the bag thicker, but more comfortable to carry. Not all security scanners like it When I tested the bag through security, the customs people did ask me to remove my laptop from the bag after all. We went through security screening with the bag open, and the screening people were not crazy about my plan, and instructed me to remove it from the bag. However, removing it and putting it back was a cinch! I didn’t have to disturb any of my other items and was able to quickly slide it back in the bag and be on my way. Though ECBC does claim for it to be TSA friendly, even if you can’t get your bag through security without taking it out is not a big deal. Having the dedicated zip-out sleeve makes it easy to slide in and out without having to disturb all the other contents of the bag. 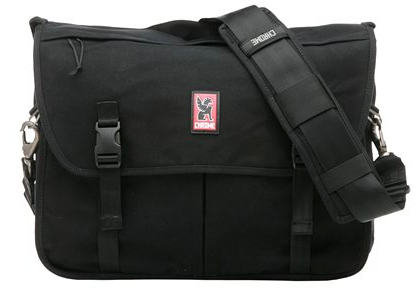 The bag retails for $119.99 and is available on the ECBC website. ECBC usually offers free shipping on purchases over $75. Check the ECBC website for current sales and coupons.